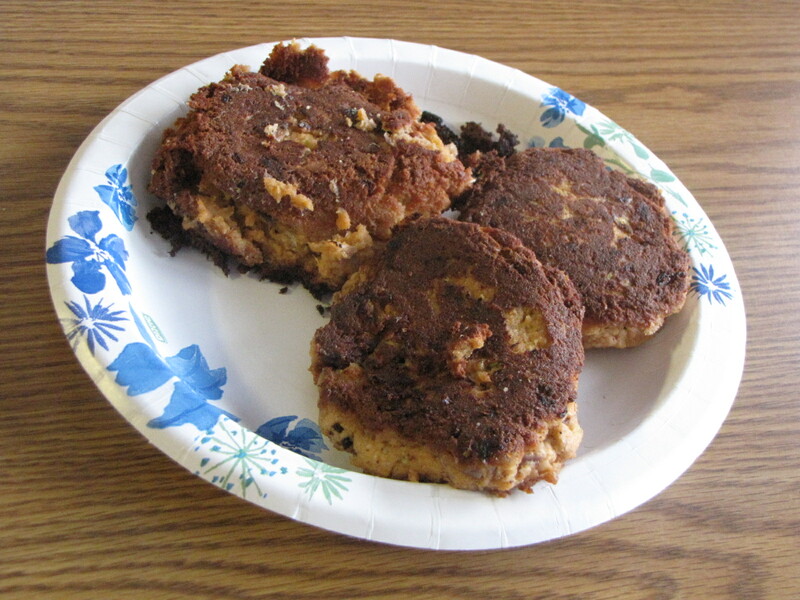 I made these for supper tonight with buttered broccoli…this recipe made 12 patties. Enough for supper, and enough for lunch tomorrow too. Being on the GAPS Diet, I like to cook in bulk…it saves me work in the long run. Blend all ingredients EXCEPT the coconut flour in a food processor until it is a fine paste and you no longer have big chunks of onions, etc. The salmon that I used had the bones. I was initially a little horrified upset and had visions of spending an hour picking them out…when I realized how brittle they were. The bones are a great source of calcium and magnesium, so I decided to run them through the food processor and see what happens. They were totally ground up – no crunchy bits in the patties – you’d never know they were there. 🙂 It did take a few minutes to get it all to the consistency I wanted, so don’t lose hope if it is taking awhile…I also wanted to be sure the bones were totally ground or I knew no one would eat supper! At that point, add the coconut flour, and process further until thickened and the flour is mixed in well. Form into patties and fry on both sides in 1/4″ coconut oil in a large frying pan until well browned.